New technology that takes pressure washing to the next level. 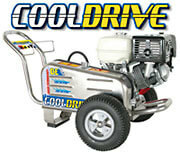 This state of the art mobile pressure washer is designed to be more durable and save you money in the long run. The unit is equipped with a cooling system that contains air vents, a pulley system and cool air propeller which all work together to achieve a reduction in heat build up. This will prolong the machine's pump life expectancy by up to 25%. The entire power washer system is set up on a stainless steel frame, which is then supported by two 13" foam-filled tires. 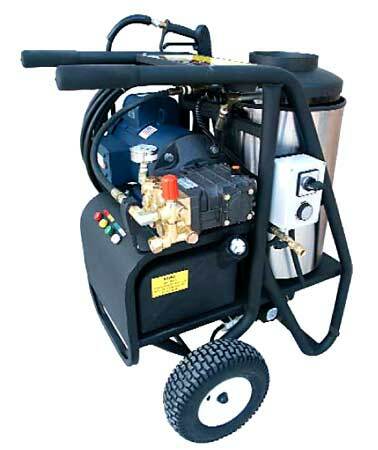 Mobile pressure washer standard features include chemical injection for continuous application of cleaning solution, long pressurehose for more movement freedom, 4 spray tips (0-45 degree water spray disperse) interchangeable and practical for any powerwashing job, rust-free stainless steel frame, stainless steel safety belt guard, and a hi-rated trigger gun and wand for a good grip and smooth operation.